Published: Oct. 30, 2014 at 04:55 p.m. 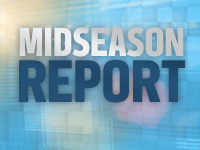 Updated: Oct. 31, 2014 at 10:12 a.m.
On Wednesday, our Midseason Report spectacular looked at teams set up for a second-half decline. Now, let's look at the squads we ahve reason to believe will go on a roll due to a soft second-half schedule. Green Bay Packers: There are some tough games ahead, but they are mostly at home. Five of Green Bay's final eight games will be played at Lambeau Field. Their three road games are all very winnable: Minnesota, Tampa Bay and Atlanta. They have already got their division trips to Detroit and Chicago out of the way. The Packers could be competing for a bye in December. Washington Redskins: Robert Griffin III will return just in time to face two of the worst teams in the league: Minnesota and Tampa Bay. The rest of the schedule is hardly a cakewalk, but the Redskins should embrace the opportunity to play three division games in a row to end the season, with two at home. They will be favored in another home date against St. Louis. Carolina Panthers: Every team in the NFC South has hope because it might only take eight wins to make the playoffs, and they all get to play each other down the stretch. The Panthers have two games left against Atlanta, plus manageable home games against Cleveland and Tampa Bay. Indianapolis Colts: The Colts' schedule has been mostly challenging so far, and that will continue through the next two games in New York and then at home for the Patriots. After that, the Colts have the easiest stretch of any AFC contender. They play only one currently with a winning record in the final six weeks, with some home games that look like automatic wins.